If you’re blessed with perfect weather year round, good for you. 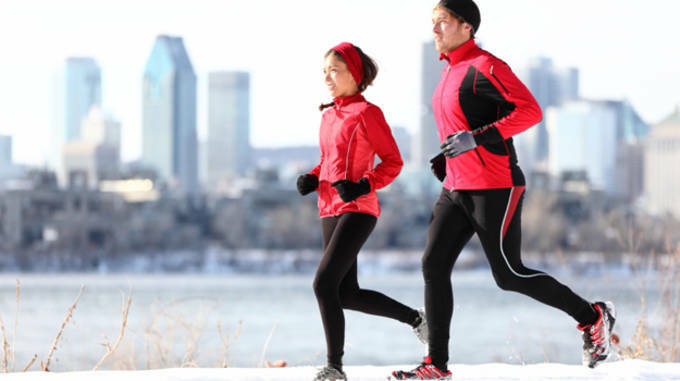 For those of us who aren’t as fortunate, running in the winter can become a pain if you’re not prepared. Now that you’ve followed our guide to picking out your perfect winter running jacket, it’s time to turn the focus on your shoes. If yours aren’t cutting it against the elements, it’s time to consider more viable options. The thing about bad weather is that it can turn ugly at moments notice during the winter season. 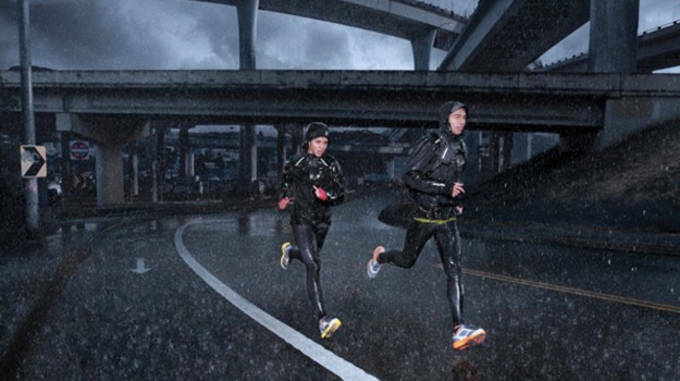 Having a running shoe that is equipped with weatherproofing technology will go a long ways to ensuring you are protected from the elements. There are two things to consider here: whether a shoe is water-RESISTANT, or water-PROOF. With the former, you get protection against light rain and wind. With the latter, weather is not a factor. Just remember, there’s nothing worse than coming home with wet socks. Some runners are just fine with the way running in the cold makes their toes go numb from pain. Most of us aren’t like that. For us, it’s important for a shoe to be warm and uncomfortable. Nothing overbearing—maybe just an inner liner that can act as another layer of protection from the weather. Because remember, the longer you run, the more your feet are going to radiate heat (and sweat). Warm is good and all, but you don’t want to overheat either. These days, you’ll be lucky to make it home from work while there’s still light out, so when it’s time to lace up for your daily run, chances are you’ll encounter low light conditions. Needless to say, runner safety comes into play. Fortunately, running brands are well aware of the potential hazards. These days, you’ll likely find some sort of reflective material on many of the popular running shoes. 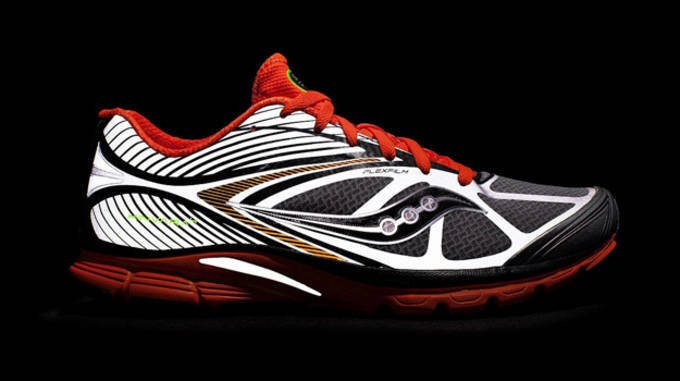 Some brands—we see you Asics, Saucony, Nike—go all out for their runners with 360-degree reflective coverage. Also, glow-in-the-dark shoes a becoming more of a trend as of late! The first name that comes to mind here is Vibram—for good reason too. 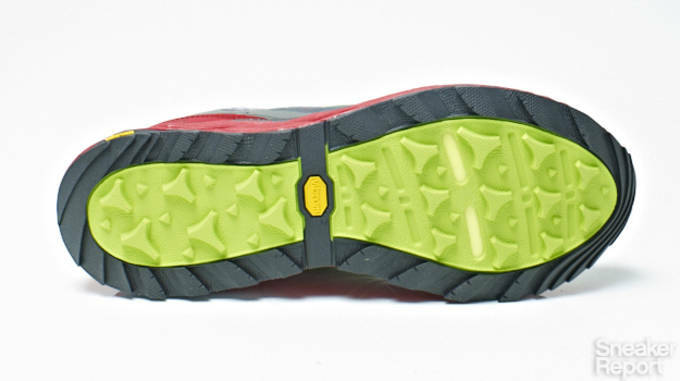 It you want the best of the best in traction, Vibram is a heavy hitter. 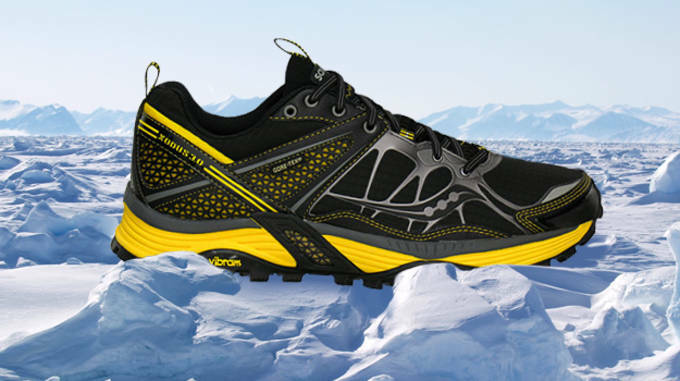 More often than not it’s the go-to choice for runners looking to venture out onto the winter trail without having to think twice about slipping. Vibram outsoles can handle rain and snow without skipping a beat; they’re also extremely durable. That’s not to say that footwear brands don’t have their own means of traction. Depending on what type of weather conditions you encounter in your neck of the woods, you generally want a shoe that has non-slip rubber outsole with multi-directional lugs for gripping the wet road (or trail). It may seem counterintuitive, but you still need proper ventilation in a perfect winter running shoe. 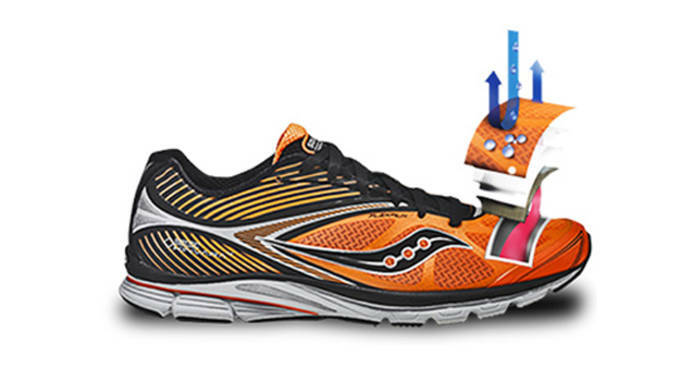 Make sure the weather -proof membrane on the shoe is breathable. Otherwise, you’ll have to worry about puddles inside your shoes rather than out (cue that C+C Music Factory).